The urban landscape may be a concrete jungle, but it doesn’t need to behave like one. So low impact development is really a statement of a desired outcome--the outcome of a holistic approach to urban drainage management. 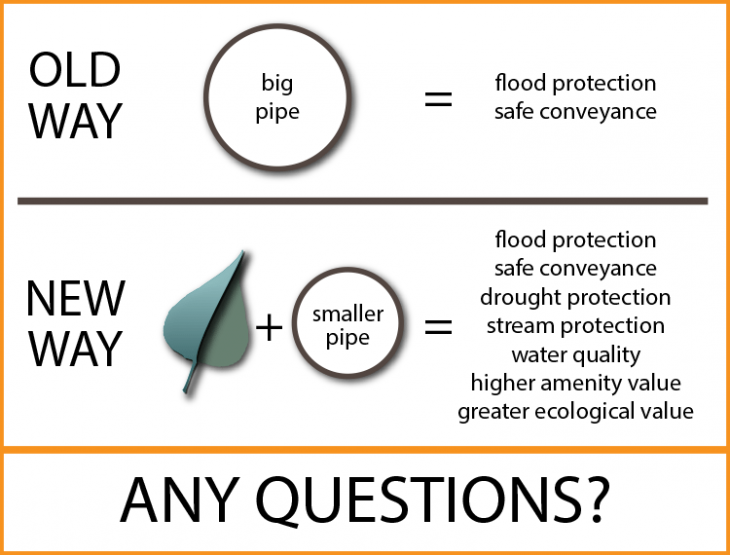 Low impact development doesn’t just achieve flood protection during extreme rainfall events -- it achieves more -- by considering the entire hydrologic cycle and mobilizing the whole landscape. As a result, cumulative impacts are lessened, the burden on conventional infrastructure is reduced, ecological functionality is maintained or restored, and water supplies are cleaner and more secure. Taking its cues from the science developed in the field of wastewater treatment over the last century, low impact development uses a toolbox of practices (the treatment train) to achieve its goals. From non-structural measures implemented long before shovel meets soil, to practices during construction, measures that homeowners can take, and public infrastructure, the whole landscape has a role to play.